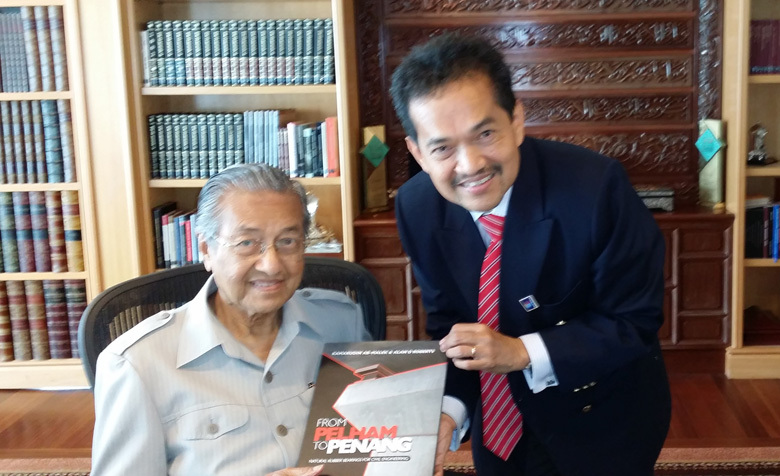 Dr Kamarudin Ab-Malek, CEO of TARRC met the former Prime Minister of Malaysia, YAB Tun Dr Mahathir bin Mohamad, at the Perdana Leadership Foundation, in Putrajaya, Malaysia on the 23rd July 2014 to discuss the use of seismic rubber bearing technology in the future. Caption: Dr Kamarudin Ab-Malek presents his book ‘From Pelham to Penang’ to the fifth Prime Minister of Malaysia, YAB Tun Dr Mahathir bin Mohamad. Dr Kamarudin also met with Y Bhg Dato Paduka Awang Hj Suhaimi bin Hj Gafar, Permanent Secretary at the Ministry of Development of Brunei, on the 10th July 2014 at the Ministry of Development office in Bandar Seri Begawan to discuss the possible adoption of the seismic rubber bearing technology for the new 33km Brunei bridge which is currently being designed.